Recently, some friends gobbled down two plates of chye tau kueh from the hawker centre in front of me whilst I munched on my gluten-free carob muffin. They felt a bit guilty comparing their fried dish with my healthy snack but actually I really wished I could eat chye tau kueh too! I came home and flipped through my mountain of cookbooks and finally found a somewhat poorly-written recipe for ‘Singapore-Styled Stir-Fried Turnip Pudding 星洲炒蘿蔔糕’ in a Hong Kong produced cookbook called Asian Snacks Cooking Course 亞洲小食製作教程. Unfortunately, I couldn’t find a more authentic recipe in any of my Malaysian cookbooks (an excuse to buy even more :) ?!?). Anyway, it worked really well so am sharing here with you. 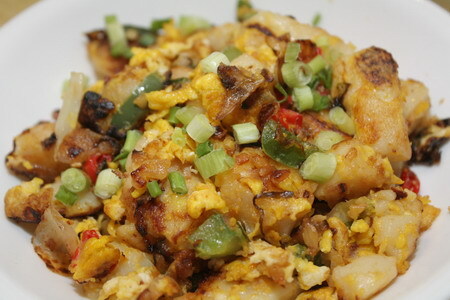 You may want to compare this recipe with the one from Lily’s Wai Sek Hong. This is a great snack option that’s wheat- and gluten-free, also no sugar. As long as you don’t find fried foods too unhealthy :). Wash, peel and chop the daikon. Use a blender to puree it, then using a sieve, squeeze out as much juice as possible. You need 3 cups of daikon juice. Mix rice flour with daikon juice in a pot over low heat. The original recipe only uses the juice, but I put in all the daikon pulp as well so as not to waste it. Stir until it the mixture thickens. This part requires careful attention as it can take quite a while to thicken on low heat but if the stove is too hot, it will clump together very quickly. 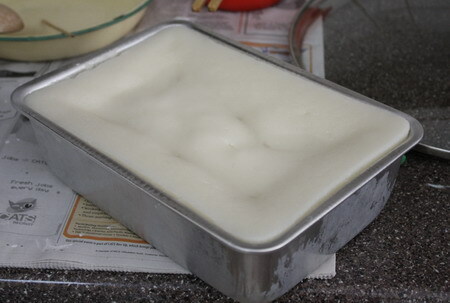 Pour the thickened batter into a greased mould, such as an aluminium cake tin. A 9-inch round tin is actually better than the one I used in the photo because it won’t be so full, and because the cake won’t be in such a thick layer, it will take a shorter time to be fully cook. Dark-coloured heavy cake tins are not good for steaming, they don’t seem to conduct heat very well. Steam for 1 hour. Test for doneness with a chopstick, which should come out clean. Cut the steamed and cooled cake into cubes. Fry ingredients of your choice until fragrant, such as garlic, shallots, minced meat, red or green chilli, spring onions. Add seasonings of your choice. Traditionally, this is cooked with thick dark soya sauce and preserved turnip and preserved Chinese sausages are a must, with a special chilli sauce for those who like it spicy. Add the steamed radish cake cubes and fry until browned. Push ingredients to one side of the wok (or remove from pan), add a beaten egg and when semi-cooked, toss well with all the other ingredients. My version shown below is cooked with salt (or organic tamari), garlic, stir-fried shallots, green and red capsicums, and topped with raw spring onions and deep fried shallots. Verdict: close enough to the real thing to keep me happy! Loved the distinct daikon taste in the cake. Now if I can just figure out how to make preserved turnip or chye poh at home, the other members of the family might actually enjoy this as much as me :). Nearly 1kg of daikon makes a lot of chye tau kueh and I had this in my lunch bento for days!! Next time I’ll only make half the quantity! One of the most popular reads on this blog is my posting on steamed Chinese radish cake 蘿蔔糕. The same basic recipe can be adapted for a whole range of other root vegetables — such as pumpkin, sweet potato or yam — and a supporting cast of ingredients. These are traditionally preserved Chinese sausages and meats, dried shrimp, dried Chinese mushrooms etc., but you can substitute anything of your choice. As I discovered with the steamed radish cake, it’s also no problem to omit the secondary ingredients and still have a tasty dish, especially if you are trying to cater to food sensitivities and avoid nasty preservatives. This is a good recipe for food rotation and avoiding wheat, gluten (does the 1 Tbsp of cornflour count? ), sugar etc. This time round I used a yam (a ‘real’ yam, not the taro I have been calling ‘yams’), and a slightly different flour mixture from the radish cake. This recipe is based on a ‘Five Spices Yam Cake’ from the bilingual cookbook, ‘Steamed Cake & Kuih Muih 蒸蛋糕與糕點的喜悅’ by the Malaysian publisher, Famous Cuisine. 1) Mix batter ingredients well, using hands to make sure that all lumps of flour are dissolved. 2) Stir fry the shallots until fragrant, then add yam cubes and fry till they are cooked. 3) All filling to the batter, keep stirring on low heat till it thickens. Be careful as the corn flour causes thickening very quickly. 4) Remove from heat and pour into a steaming tin. 5) Steam in preheated steamer at high heat for 35-40 mins or until cooked through. Leave to cool. This steamed cake turned out more firm than the radish one. And while the radish was cooked until it disintegrated and mixed with the flours to form a smooth batter, in this recipe, the yam and shallots floated to the top creating a distinct layer. This is most delicious eaten steamed & warm, but also great for bento. Ever since I started experimenting with different foods in an attempt at food rotation, I’ve been thinking of cooking this dish. It’s made from Chinese white radish, also known as daikon (and most confusingly, can be called ‘carrot’ when translated into English, as I’ve noted here). What held me up was trying to think of substitutes for the usual preserved meats and dried products that usually go into this dish: laap cheong Chinese sausages, laap yok waxed pork, dried shrimps, dried mushrooms. Without the seasoning of oyster sauce, soya sauce and sugar, and no flavourful ingredients I wasn’t sure how this dish would work at all. In the end I just went ahead and made it absolutely plain and believe it or not, it was absolutely delicious! There are no fillings in this lor bak gou at all, and no seasoning apart from a tiny pinch of salt, but the familiar taste is unmistakably that of lor bak gou ☺. Everything is in the additional toppings which can be adjusted to suit individual taste, so those family members who want to load up on laap cheong and bottled chilli sauce can do so as well, leaving the rest of us to enjoy this in a more simple fashion. The toppings shown in the photo are chopped spring onion, homemade fried shallots, sesame seed furikake and sesame oil — my favourite way to garnish this basic lor bak gou. This dish is suitable for bento, and the toppings can be packed into dedicated bento condiments containers, or even just wrapped up in folded aluminium foil. Personally, I prefer to eat lor bak gou warm and I didn’t try it in any bento this time round. I decided to go with the quantities in what appears to be the most reliable of my cookbooks, Dim Sum by Chan Chen Hei, a renown chef who’s worked at top restaurants and hotels in Hong Kong and Singapore. The method was adapted from combining instructions in various cookbooks. 1) Peel and shred the radish (using a ceramic peeler and ceramic julienne slicer, if you have them ^_^). You can also chop the radish into strips, it’s said that these larger chunks give a better texture to the final dish. 2) Mix the flours with just enough water to form a smooth, liquid paste. 3) Pour the remaining water into a pot, put in the radish, season with salt to taste, bring to the boil and cook until it has turned transparent and soft. 4) Reduce the heat to low or turn off the heat completely and stir in the flour mixture. Combine thoroughly until thick and sticky. 5) Grease a container to hold the radish batter for steaming. If you wish, you can line the container with cling film to make it easier to remove the cooked radish cake intact. You can use any dish suitable for steaming, or even a disposable aluminium cake tin (cling film not needed, because you can transport, store and serve the radish cake in it, no need to remove the cooked product from the container) . In my experience, try to avoid anything that’s too thick and heavy or which does not conduct heat well. 6) Pour in radish mixture and smoothen the top. Preheat the steamer and steam on high heat for at least 30 minutes. It could take as long as 1hr, depending in the quantity and shape of the radish cake. Test the middle with skewer or chopstick; if it doesn’t stick, the dish is done. There will be a watery liquid on the surface. Just leave it as it will be absorbed as the radish cake cools and prevents the surface from becoming dried out and cracked. 7) As the cake cools, it will firm up. You can then slice, garnish and serve. Optionally, you can pan fry the slices until brown and fragrant, then garnish and serve. Personally, I think this tastes best when hot. I kept it in the fridge and heated it up before eating. However, I found that it did not microwave very well. The outer edges would be hot and the centre still hard and cold, so I ended up having to reheat by steaming. Which isn’t really a bad thing since we should try to avoid the additional EMF exposure from microwaves — not to mention the questionable effect eating microwaved food (read more here and here), if we weren’t already so addicted to their convenience. 1) Boil sufficient water for steaming in the kettle. 2) Whilst the kettle is boiling, heat up the pot on the stove by putting just enough water to cover the base. 3) When kettle has boiled, pour contents into the pot, which should be at boiling point by now. 4) Invest in good quality pots as the heat conduction is noticeably superior and the contents will boil faster. 16/4/08 Update: Just found this video of a cooking show demonstrating how to make traditional Hong Kong-style steamed radish cake, which is characterised by Chinese sausages (in Taiwanese dialect with Chinese subtitles). 13/6/08 Update: see also my steamed Chinese yam cake. I’m back to experimenting with steamed Asian snacks. These ‘exploded’ steamed cupcakes (which probably accounts for their name in Chinese which means ‘risen cake’) are quite common. In Singapore, they are usually referred to by the Hokkien pronunciation, huat kueh, but I’m more at home with the Cantonese name, fatt gou, which is also used in the Malaysian Chinese bilingual cookbooks. While all the Malaysian Chinese recipes I’ve found use yeast, the recipe in this Taiwanese book of Chinese cakes used only baking powder – much easier and also avoids triggering possible food sensitivities to yeast I might have. 1. In a bowl, mix the white sugar, egg white, oil and water until evenly combined. 2. Mix the cake flour, wheat starch and baking powder in a large bowl. At this point, I noticed a slight sourish, sort of chemical smell coming from the flour mixture but I’m still not sure what it was. 4. Divide into 2 or three portions depending on number of colours/flavours desired. Add in the cocoa powder and/or strawberry jam to one portion each and mix well. I made cocoa and plain. After adding cocoa powder to the batter, it because a bit more stiff, and this produced a better result. After trying out one batch of mixed cocoa & plain cakes, I realised this and added more cake flour to my white batter. 5. Pour the batter into cupcake moulds. I made three sizes: large (round and square), mini and bite-sized, using a combination of silicone baking cups and an aluminium tray with bite-sized shapes which I lined with paper cups. Do not use square moulds as I did. None of the square cakes was able to produce the desired flower-shaped ‘explosion’ on top, as you can see below. 6. Steam the cakes. IMPORTANT: the water must be at a rolling boil, on high heat and do add sufficient water to steam the cakes for 15 minutes. Given the amount of dough I had, I had to steam the cupcakes in three batches (could have squeezed into two lots if I had been organised enough). The first thing is that I was very pleased with the successful splitting of the cake tops, unlike with the brown sugar steamed buns 黑糖饅頭 I made some time back. Only for the round shapes though, as I noted above. If you look at the second photo above, particularly the large brown cake, you’ll notice the cakes have an attractive glossy sheen. This effect is created by the wheat starch. The glossy skins can be easily peeled off, just as with char siew pau. Texture-wise, it had a distinctive very crumbly texture that reminded me of Chinese steamed buns I’d eaten in shops and restaurants before, perhaps char siew pau skin. It was great to produce a kind of texture I’d never made before, yet one that was immediately recognisable to my palate. However, that strange smell from the flour mixture gave the white cakes a slightly odd taste. This was masked by the cocoa powder in the brown ones. So perhaps one should avoid making these cakes in ‘plain’ flavour. But this also raises a worrying issue – just what is that smell/taste? The first thing that came to mind is that chemicals are often used to bleach and process flours. Wheat starch probably requires more processing than regular flour so is a likely candidate for chemical additives. I have used wheat starch before without noticing anything (such as here), but then again it was only in much smaller quantities. While I have been eating these cakes with no reactions, the idea of chemical fumes from my flours is rather off-putting and certainly undesirable. Another important point to note is that these cakes do not seem to freeze well and cannot be reheated in the microwave. Microwaving them the same way I do with all my muffins and cakes so far turned them into hard lumps with plastic skins. So you’ll need to steam them to reheat, and even this did not produce a nice texture on the inside. While I was pleased with the shape and texture, my concerns about the wheat starch and the fact that these do not freeze/reheat well mean that they are not practical as part of my weekly bento/snack reserves. For health reasons, processed meats full of fats, poor quality cuts, various animal parts, artificial flavourings, preservatives and other additives have not touched my plate for a long time. So when the Singapore government banned the import of processed meat products from two China brands, Maling and Narcissus, last August, it didn’t bother me (though it affected enough Singaporeans to generate a slew of new reports, cries of desperation from a Sunday Times columnist, and plenty of angry noises on the internet). I was even rather glad that the spam-loving members of my family would no longer be able to indulge their unhealthy desires. The fact that the ban might actually be a blessing in disguise was further emphasised when I read a story in the Sunday Times a few days ago that the six branches of Xin Wang Hong Kong Cafes in Singapore have started making their own luncheon meat, spicy diced pork and stewed pork ribs to replace Maling products. To make luncheon meat, minced pork is mixed with egg white, oyster sauce, flour and other seasonings, packed into metal cans and steamed for an hour. Then it’s sliced and pan-fried. The result tastes close to the real thing, but with a firmer bite. Who knows what seasonings go into the ‘homemade’ version – definitely MSG would be my guess, but it’s probably still better than the factory-made Maling product, and with less preservatives. As regular readers of my blog will know, one of my interests is how to produce common food products at home, rather than relying on mass-produced commercial items. Bread, salted eggs and soya bean milk are some basic foods which I make at home, and I’ve also been fascinated by the process of making soya sauce and tofu. And now I’m inspired to try out homemade luncheon meat too (with minimal seasonings for me, of course)! This is one reason why the cafes will go back to Maling’s luncheon meat and Narcissus stewed pork ribs once the suspension is lifted. Another is that these pork products are laborious to make. Never mind, ‘homemade’ luncheon meat or not, I won’t be eating at any Xin Wang Hong Kong Cafes anyway. There would still be far too many ingredients likely to cause nasty food reactions for me. See this list of food additives to avoid and these factsheets on possible symptoms. Don’t discount emotional reactions like feeling irritable and angry, as well as less obvious physical reactions like foggy-headedness — along with itching and hives, it’s my most common reaction when eating out, usually enough to make me feel unable to function optimally for any mental tasks and on occasion I’ve even felt too ill to make my way home unassisted :(. Before I started experimenting with Asian snacks, I used to bake tea time snacks several times a week – as you can see from the earlier entries on this blog. So my weekly supermarketing would inevitably include dairy staples of butter and eggs. Recently, I noticed that my stock of eggs and butter has been sitting in the fridge for a long time and realised that it’s because of my concentration on Chinese and Japanese snacks, which are mostly steamed. At that point it also struck me that these Asian snacks are wonderful vegan or dairy-free recipes (just make sure you substitute vegetable oil in any recipes that call for lard!). However, I had to find a way to start using up all those eggs so I chose a recipe for a steamed cake that uses eggs. In Chinese, dan gao 蛋糕 is used to refer to western-style cakes; the first character meaning ‘egg’ and the second ‘cake’. The character gao 糕 is also used to refer to all those steamed snacks, which don’t have eggs. So the Chinese name for this cake, with the word dan 蛋 immediately alerted me to the presence of eggs :). The recipe comes from the book 《糕&炒年糕》. Actually, apart from creaming and muffin mix method, I have very little experience with cake-making techniques. So working with eggs and whisking them was a bit of a challenge. I didn’t know why the step-by-step photos showed first a yellow whisked mixture of whole eggs and white sugar, which had become white in the following photo so I thought I would try out the method used in this pandan chiffon cupcake recipe where the egg whites and sugar are whisked first, and then the egg yolks blended in. It gave me a chance to practise separating eggs ^_^ (had one casualty, which I used for French toast later). Once the egg & sugar mixture was done, I folded in the sifted mixture of cake flour, wheat starch and baking powder. The cake mixture then went into a oiled square baking tin. In the recipe book, cling film is used to line the containers but I thought oiling the tin might be less wasteful. If so desired, you can sprinkle raisins to taste on the surface of the cake mixture. I used the same organic sultanas as I did in this oatmeal cake. Steam for 20 minutes. After my problem with the overly-dense texture of these brown sugar steamed buns, I made sure the water was really vigorously boiling before I put the cake in to steam. In terms of texture, the result was similar to the photo in the recipe book, but it still seemed rather too dense to me. In retrospect, I think I didn’t whisk the egg whites enough (tired! and the volume didn’t seem to increase anymore…), and only got to the ‘soft peak’ stage, when I really should have continued till the ‘hard peak’ stage. Another problem was that there were large air holes in certain parts of the cake. Possibly I didn’t mix the dry ingredients properly. Alternatively, I should have banged the cake tin to release any air bubbles to the top of the mixture. The texture was also sort of bouncy, just like the brown sugar steamed buns, so I guess this could be a characteristic of steamed cakes. As for the taste, it was uh, rather egg-y. It smelled and tasted sort of like hard-boiled eggs!?! I wonder if more sugar would have masked the egg smell (after all, I used about 1/3 of the suggested amount)? Perhaps pandan leaf juice or vanilla essence would also have done the job. Verdict: love the straightforward recipe and simple list of ingredients, but will need to try again to get a better result in taste in texture. This was another one of those almost-disasters, or a cooking adventure if you look on the bright side :). It’s Project No. 3 in my exploration of alternative flours and different ingredients as part of food rotation to deal with food intolerances. The new flour used here is Water Chestnut Flour (click on link to read more). I found similar recipes in two different cookbooks: Dim Sum by Chan Chen Hei and 糕&炒年糕 by 金華, and ended up following the latter recipe simply because the quantities of ingredients were in round numbers and hence easier to measure out :). The book also has step-by-step photo instructions. The ten water chestnuts I had purchased, after peeling, weighed 150g, which determined that I would have to base the rest of the ingredient quantities around that, i.e. half the amount stated in the recipe. 1) The instructions are to mix water chestnut flour and custard powder with 125ml of cold water and mix evenly into a smooth batter. However, I have commented here on the ‘nasties’ in custard powder, which is basically a combination of corn flour, flavourings and yellow colouring – usually annatto or tartrazine, which can both cause a whole host of allergic reactions. So I had to figure out what to substitute the custard powder with. Decided I could forgo the fake custard taste and artificial yellow colour, but thought the thickening function might be important so I added one teaspoon of cornflour to the water chestnut flour. I later discovered the reason for using cold water: because on heating, the flour immediately thickens and hardens into a semi-solid! 2) Chop the water chestnuts. Chef Chan Chen Hei’s instructions say not to dice them too finely or you’ll lose the crunchy texture of the water chestnuts in the final product, but also not to cut them too coarsely or the dish will look rough. 3) In a pot, bring to the boil the remaining water, adding the caster sugar and chopped water chestnuts. Cook until all the sugar is dissolved. 4) Add the batter slowly whilst stirring the boiling liquid all the while. Keep stirring constantly until you have a smooth, thick paste. This is where I made a total mess of the dish :P. As I was trying to scrape the last traces of batter out of the bowl, I didn’t realise that what had gone into the boiling sugar liquid had solidified into a big clump! Some of it turned transparent but there were white bits where the batter had become trapped with a solidified outer layer. Taking the pot off the stove, I tried to break up the solidified bits but it was impossible and I finally had to resort to using a handheld blender to try and break up all the bits. In the process, the water chestnuts pieces were also pulverised of course. It was impossible to get a smooth liquid but when it all seemed reasonably even in texture, I proceeded with the recipe instructions. 5) Pour the cooked batter into a square or rectangular dish. You may want to line the dish with cling film for easy removal of the steamed cake later. Place the dish in a wok and steam over high heat. The instructions said 45 mins, but Chen Chan Hei’s book says 20-25 mins. Since I was using half the quantity, I set the timer for 15 minutes. The dish had turned translucent after 15 mins but I left it for an extra 10 mins just in case. 6) After steaming, cut the cake into slices. I found that the cake became more firm when it cooled. 7 ) Can be eaten cold, reheated by steaming, or fried. I found the dish tasted too sweet at this point, and gave me the feeling of being rather yin. So although I had planned to eat it after steaming, I decided to fry it in batter to counter the sweetness and ‘cooling’ effect. Combine dry ingredients with enough water to make a thin, smooth batter. Leave to stand for 30mins then test consistency again, adding more water if necessary. When ready to use, stir in the oil. Cut water chestnut cake into strips, dip into batter and deep fry. Verdict: Really need to try again!! At a basic level, the dish was surprisingly palatable despite the disaster halfway. Tiny scraps of crunchy water chestnut were still occasionally discernible, but as you can see in the photo, the texture was lumpy, resembling sago pearls. That can be quite nice too, but obviously that’s not what this dish is supposed to be like. The fried batter was nice and crispy, but just sooo oily, it gets a bit heavy to eat more than two pieces or so. You can cut down the amount of fried batter by cutting larger pieces (like the larger piece in the background of the photo) but then in this case, there would be way too much overly-sweet water chestnut cake in proportion to the unsweetened batter. 6/12/07 update: Just thought of another way to eat the steamed water chestnut cake. I really don’t want to make the fried version again because it’s simply too oily for my taste. I wanted to find some way to tone down the excessive sweetness of the water chestnut cake, so unsweetened red bean soup seemed like a good idea. Since the water chestnut cake has a texture somewhat like sago pearls (actually, it’s closer to the crispy+chewy texture of Chinese shredded jelly fish salad), anything you can put sago into would also work here. In theory it worked OK, but I think the taste of this water chestnut cake just isn’t that appealing to me so I didn’t enjoy the red bean version very much either :(.